Getting the most out of life was a consistent theme in our “In the Moment” posts during March. We invite you to take a glance at those you may have missed, or a second peek at those you’ve already enjoyed. 1. 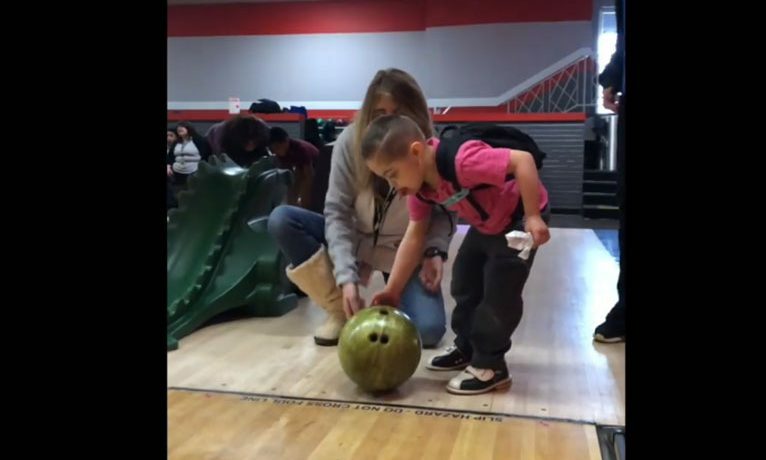 Special needs didn’t keep kindergartner Jack Cleavenger from a field trip with classmates. 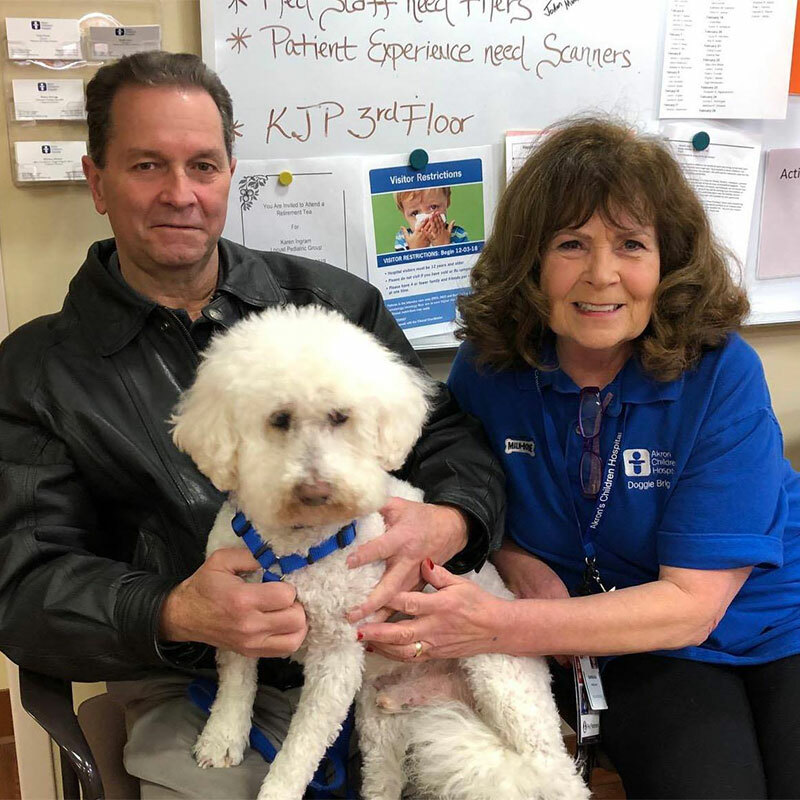 To ensure Jack’s safety and happiness, Educational Assistant Therese York and Medical Assistant Emily Ocheltree (not shown) were there to help. 2. We asked you to give a shout out to your favorite doctor for National Doctors’ Day! 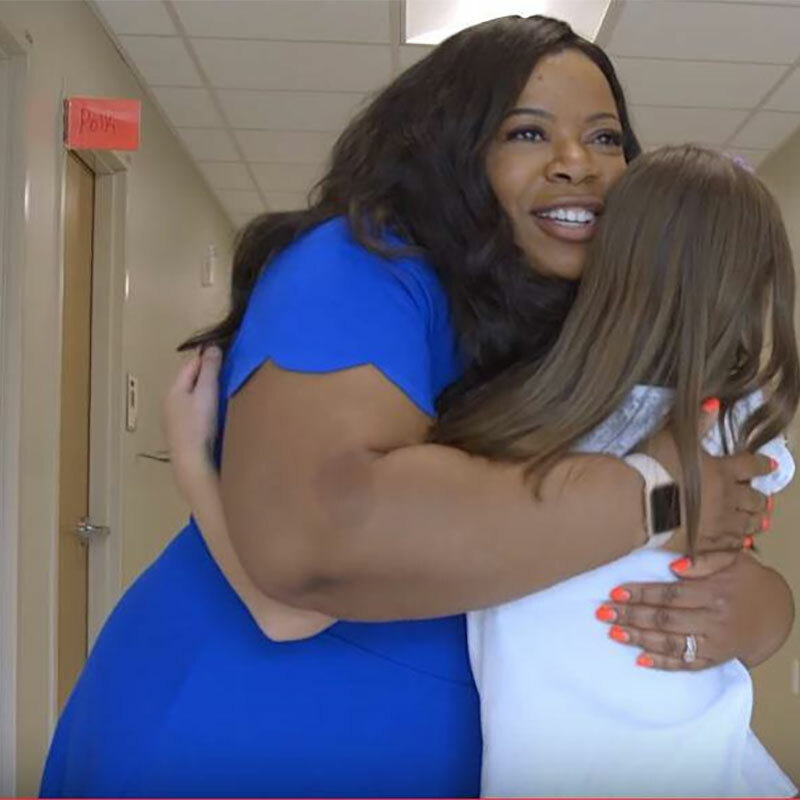 Pediatric Neurologist Dr. Chinasa Nwankwo cares for epilepsy patients like Stella Miller. 3. Sammy and his owner, Barbara McKelvey, hung up the leash after 10 years on the Doggie Brigade, sponsored by Milk Bone. Mike and Barbara McKelvey were moved to be honored on Sammy’s retirement. Barbara said she and Sammy began to volunteer because of her love for children and Sammy’s great personality. 4. For the second year, several of our patients participated in the “Adapt-A-Car Workshop” with Inclusioneers! 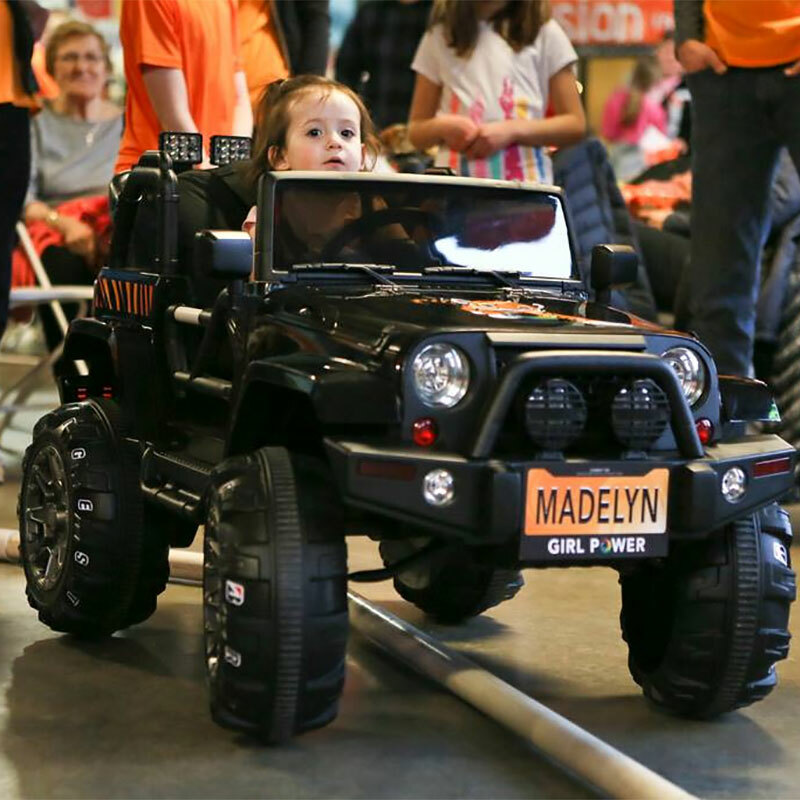 Madelyn Trachsel, age 2, doesn’t let spina bifida slow her down. She uses her “Girl Power” to cruise along in a tiger-themed Jeep. 5. 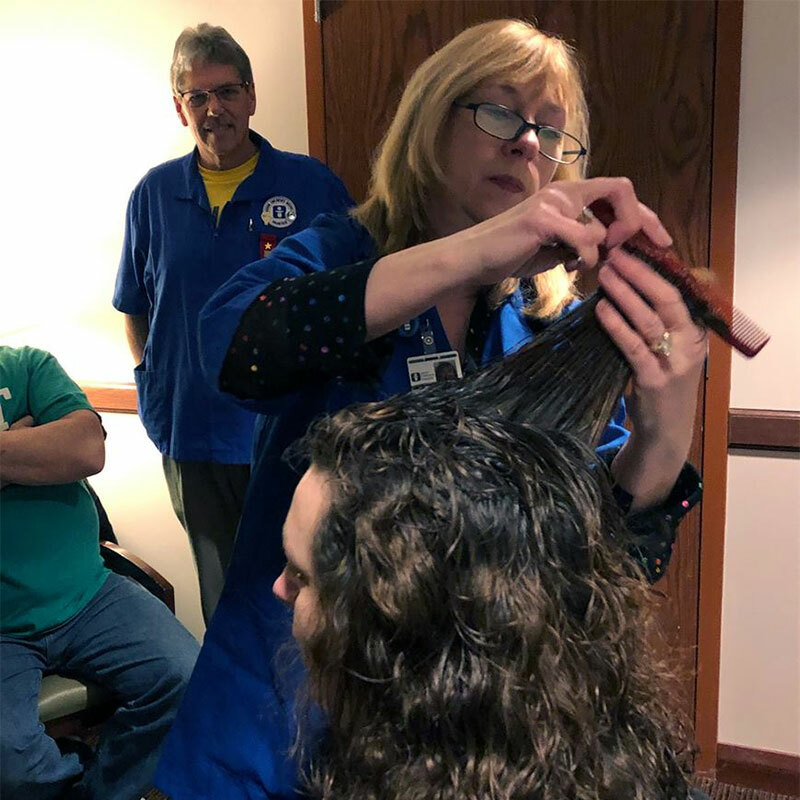 Volunteer Mark Geschke started the Jody Smith Salon in the hospital’s Reinberger Family Center. The salon offers free services to families. Volunteer hair stylist Michelle Lumadue gave parents Tom and Nancy Ely a trim in the makeshift salon. 6. Even though Meagan Gries’ daughter Molly Ann died at 2 months old, she still shops for toys on her birthday. 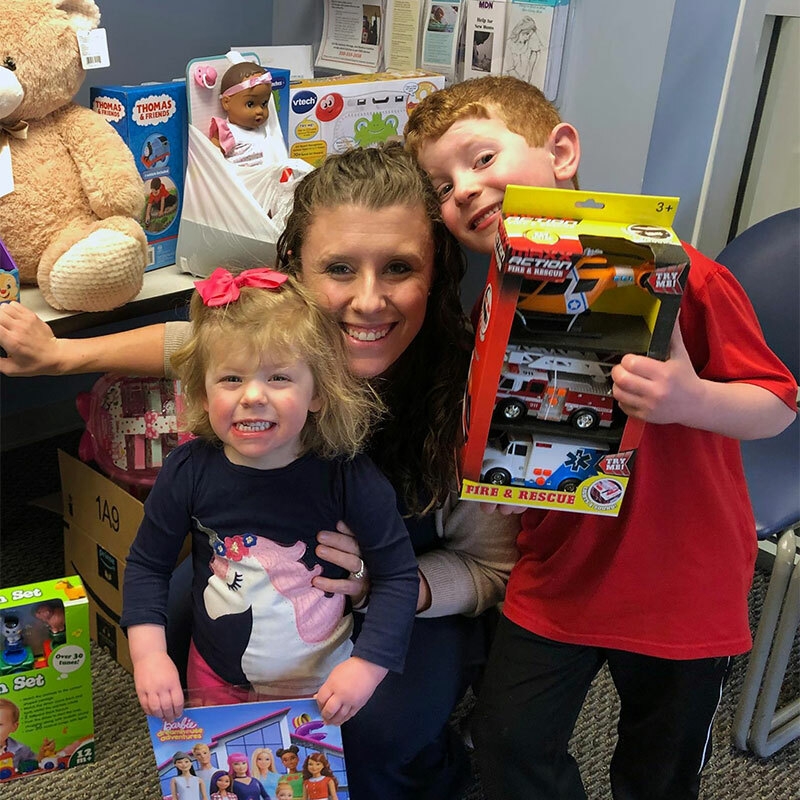 Meagan donates the toys to Akron Children’s Hospital in Molly Ann’s memory and to promote awareness of safe sleep environments for infants. This is the second time the family has donated to Akron Children’s in Molly’s memory. Older brother Owen is 5, while younger sister Emma is 2.5. Molly would have been 4. 7. 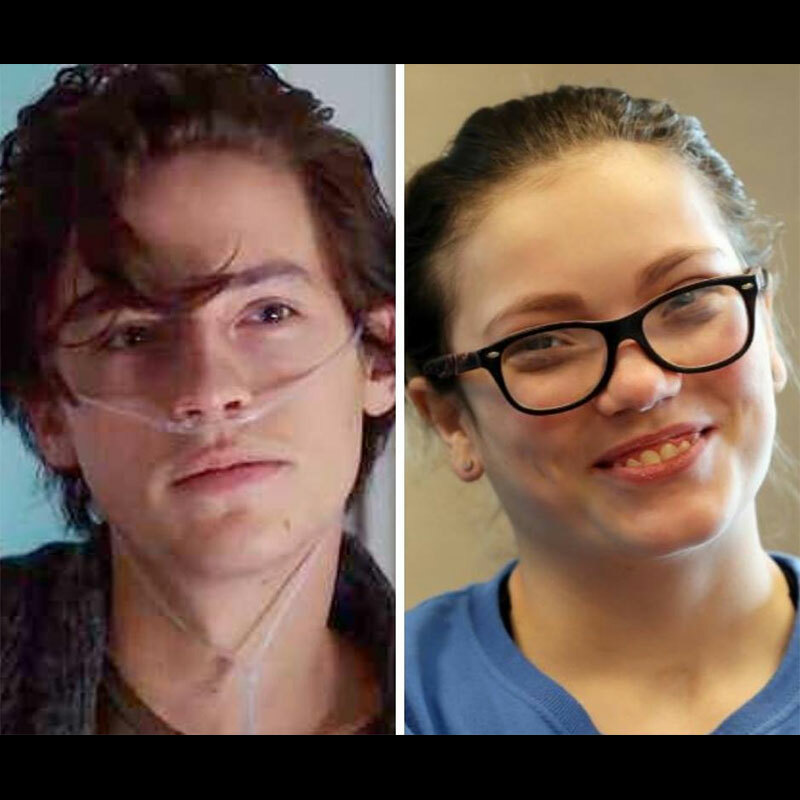 MaKarleigh Kotema and pediatric pulmonologist Dr. Gregory Omlor discussed the movie ‘Five Feet Apart’, about 2 young lovers with cystic fibrosis, a disease that MaKarleigh also has. The main character in the movie is played by Cole Sprouse. MaKarleigh,13, comes to Akron Children’s every 3 months for treatment to combat the effects of CF. She’s smitten by the movie star. 8. 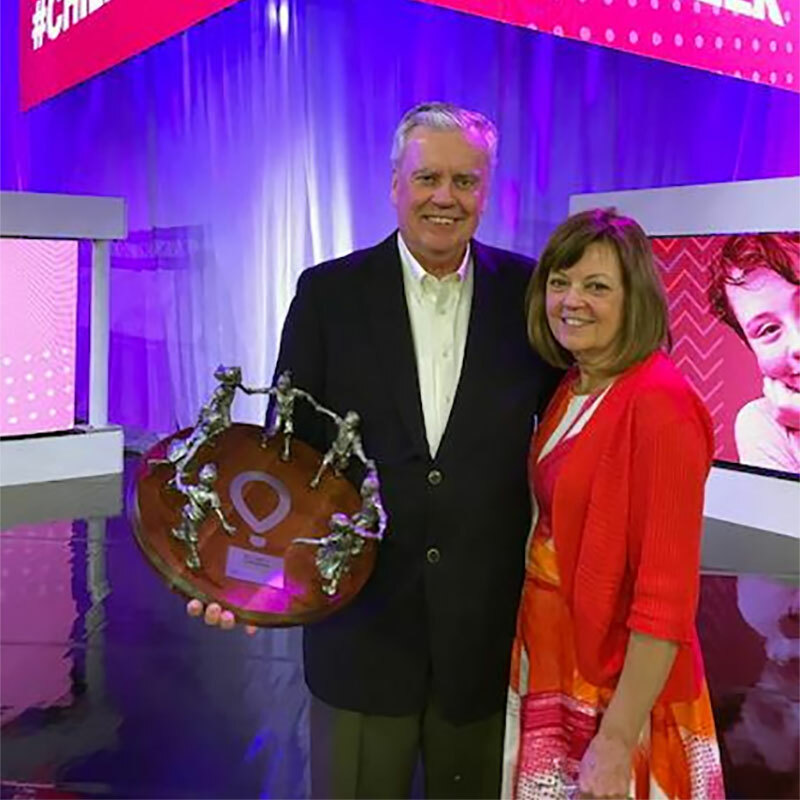 We continue to be proud and inspired by our CEO Emeritus Bill Considine. He was presented with the Children’s Miracle Network Hospitals’ Founders Award! CMN’s highest award is presented each year to a recipient whose time, talents and contributions help CMN help as many kids as possible. 9. Did you know one in every 700 kids is born with Down syndrome? 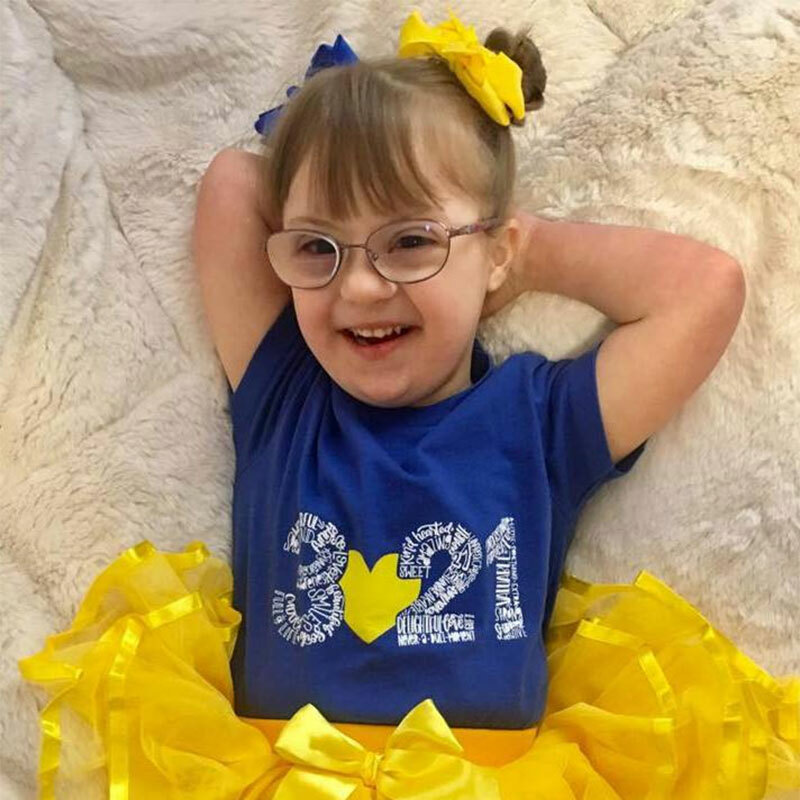 Harper does, and she wore her special ballerina outfit in recognition of March 21 as World Down Syndrome Day. Harper Cunningham is now 5, but her mom Tonya blogged for us the first year of Harper’s life. 10. Infants to teens were treated to a special time with Cleveland Browns player Chris Smith (#50), Cleveland Cavaliers Moondog and our very own Doggie Brigade at the annual World Kidney Day celebration. 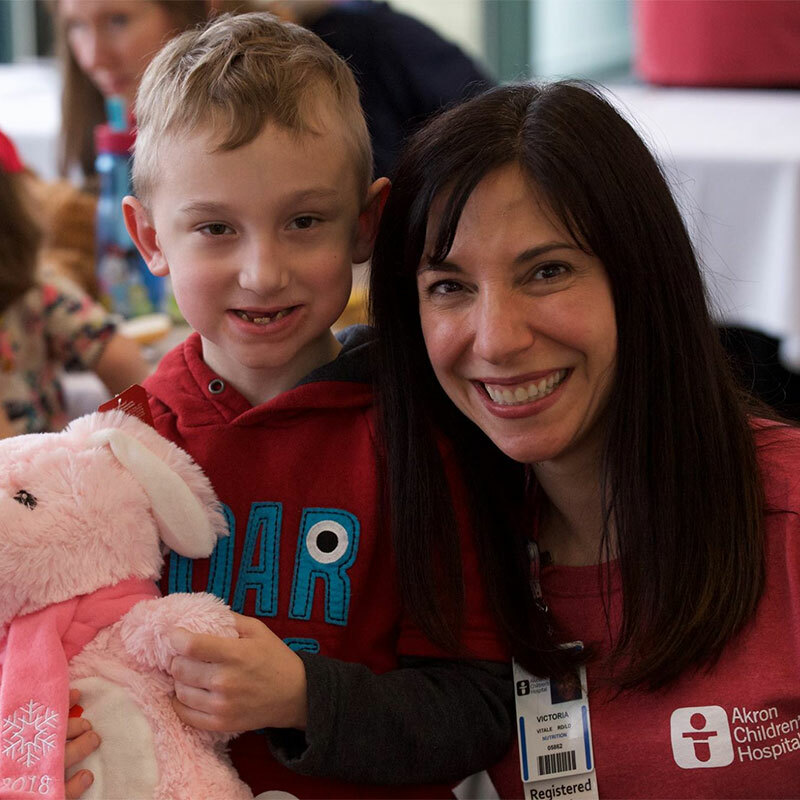 6-year-old Kaiden had a kidney transplant 3 years ago. He proudly showed his belly scar that leads the way to his new kidney, named Kevin.